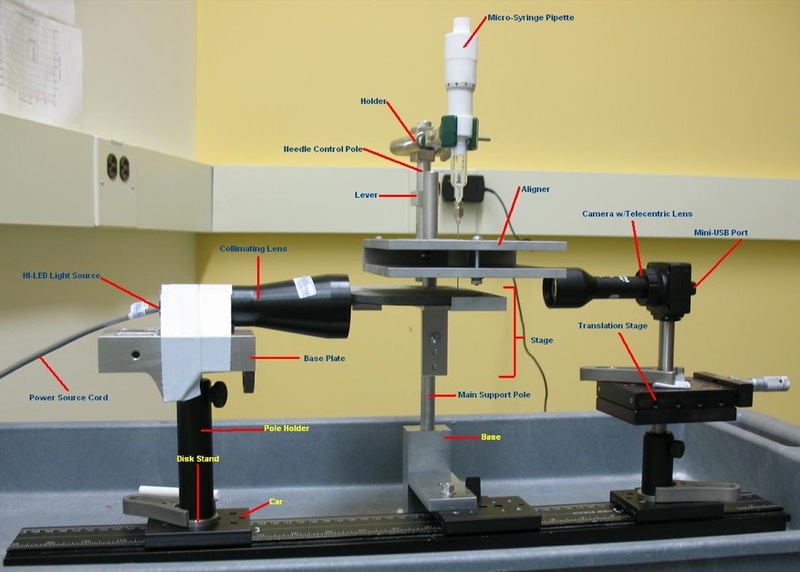 How to use the McGrath Lab Surface Contact Angle Goniometer (SCAG) to collect image data for the established uses. Please refer to the SCAG Setup Protocols for assembly instructions. Note that the details of established uses will be covered in a future post. The MS Pipette is marked in 1mL’s down the side (sub-marked by .1mL) and .01mL’s on the dial (sub-marked by 2.μL). You will need a 1/8″ Allen wrench to adjust the set screws and a short Phillips-head screwdriver to adjust the angle screws. Connect the Camera to the Computer using a Mini-USB to USB 2.0 Cable — a green light on the camera should turn on. Once the Computer recognizes the Camera, open the Fly Capture 2.0 program using the short cut that is (should be) at the top-right corner of the screen. Select “Chameleon CMLN-13S2M” from the list and click “OK” to begin an image stream. Be sure that the screw-on cap of the Telecentric Lens is off. Turn on the HI-LED light source by connecting it to its power source. DO NOT LOOK directly into the beam path to check functionality, only at its reflection off of a wall — the functioning beam is incredibly bright and has a misleadingly low degree of divergence! Check that the software view is not zoomed-in — Zooming can be done with the scroll-wheel of the mouse. Fine-focus the camera on the needle using the Translating Stage — The focal length of the Telecentric Lens is 65mm. In the Fly Capture 2.0 program, click the record button. This will bring up the Recording Settings interface. Select the location and file name (must be done each time image is captured). In saving options, under “Capture __ Frames” enter “0” for an unrestricted stream, “1” for a single image, or the number of frames you would like to capture (15 frames per second). You can also capture for a specific length of time and capture frames between intervals using the other saving settings. These settings will save between recordings but reset when the program is closed. Select whether you will save the data as a video or a series of images, and then select the format. Click “Start Recording” to begin capture and “Stop Recording” (the same button) to force the stream to end. More information on the PGR Chameleon® USB 2.0 Camera and the FlyCapture® SDK. For no tilt, insert the 0° screw into the first hole of the angle plate hanging down from the stage so that it screws in towards the Main Support Pole. Otherwise, if a specific angle is needed insert the appropriate angle screw into the second hole. If a general gradient of angles is needed, fully insert the neutral screw and gradually unscrew to increasingly tilt the stage — be sure to lock the position with a hex nut if multiple images with the same angle will be taken. To empty and reset, turn the dial clockwise until the 2mL mark is reached. Slide the glass vessel over the further-exposed projection up to the body by placing the thumb on the top surface of the dial and the middle and ring fingers about the vessel — it is helpful to use the other hand to guide and add force to the movement. 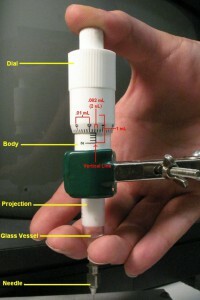 Place the needle into the liquid (DI Water) and turn the dial clockwise until the 1 mL mark is reached — do not go past the 0.5 mL mark as the glass vessel will fall off. 1 mL is enough for about 500 droplets. 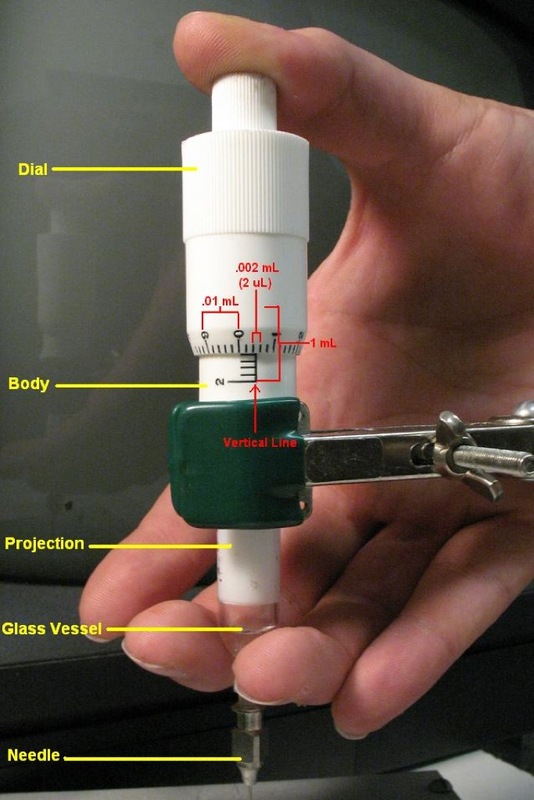 Calibrate the dial by turning it counter-clockwise to align the line down the body with the nearest .01mL mark. Push the glass vessel back up to the body (some liquid may be dispensed). To dispense a specific quantity of liquid, turn the dial counter-clockwise so that corresponding quantity of 2μL marks passes the line down the body. Position the needle and, using the aforementioned technique, push the glass vessel completely up to the body to create a pendant drop. Using other hand in guiding/pushing the vessel is very helpful here. For most sessile drop measurements, a 1-4μL/droplet is sufficient. **Note: It may take up to 3 seconds for the droplet the fully form. Waiting improves accuracy and stabilizes the drop before placement. Ensure that the long sides of the Stage runs perpendicular with the track using a right-angle tool (I used a leveling tool with cubed corners). Set the stage to the desired angle using the angle screws. Prepare a specimen disk and place it in the Stage, or simply place a prepared specimen on a plain disk. Align the lines on the disk with the two marks on the outer edge of the stage’s disk-holder. Set the Post Translator to the bottom of its range by turning the adjustment screw counter-clockwise. Stop when you encounter significant resistance. Then move the Aligner so that it sits a few inches above the stage. Place the MS Pipette in the holder. Check that the holder is oriented and telescoped so that the needle travels vertically and through the hole in the Aligner. Check that the Holder lies flush with the Translator and adjust the Aligner so that the needle lies just over the disk’s line running the width of the stage. Raise the needle ~1cm above the stage by turning the Post Translator’s adjustment screw counterclockwise. Create a droplet using the previous protocol in this series. Carefully lower the droplet until it touches the specimen by twisting the adjustment screw counter-clockwise. 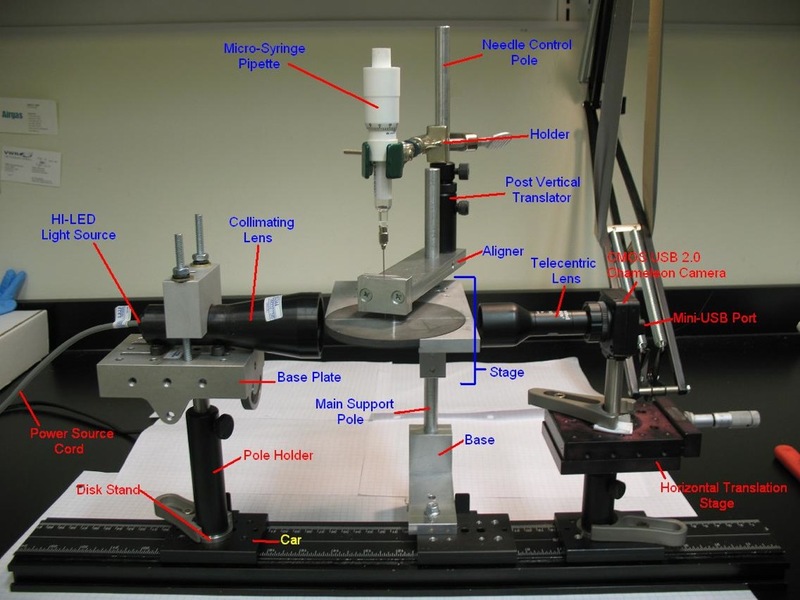 This will pull the droplet off of the needle — it is important to accuracy that the droplet is pulled off and not dropped. Note that “carefully” simply means that the lowering should be done without jostling the instrument. Such lowering can be accomplished with broad turns of the adjustment screw as the Aligner will hold the needle in place. Take an image (see the preceding protocol) and then raise the needle back to ~1cm. Either rotate the disk until the next specimen is centered in the view or replace the specimen. Repeat steps 6-9 until you are finished with this specimen disk. To remove it, retract the needle into the Aligner by adjusting the Post Translator towards full height (turn the adjustment screw clockwise) and lift the specimen/specimen disk off the stage. Be sure to check/fix image accuracy whenever a new disk is placed (that protocol is next in this series). Place a glass slip or glass-mounted example-surface over a well on the specimen disk. Place a drop on the surface above the well’s center. Focus on the needle. The baseline should contrast sharply with the illuminated section. 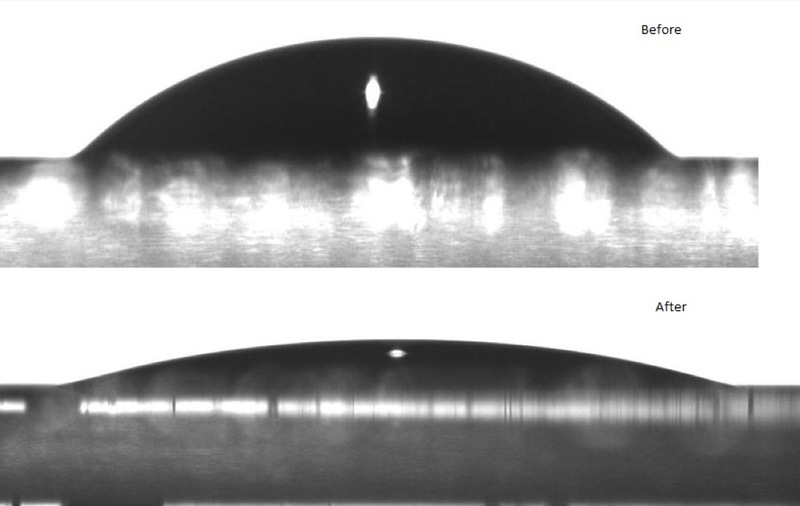 This means a uniform baseline that does not fade into white (note that the specimen disk surface looks rough relative that of glass). Skip to #4 if this is not the case. Touch a sharp vertex of some small object (an Allen wrench works well) next to the base of the drop (from the image’s perspective) and observe where the vertex sits compared to the apparent baseline of the image. If the vertex sits above or below the baseline, go on to #4. Otherwise, the image is fine. Check that the Camera and Light run parallel with the track, are stable, and are properly oriented with the stage. Check that the specimen disk is level with the stage and that the stage is level with the track. 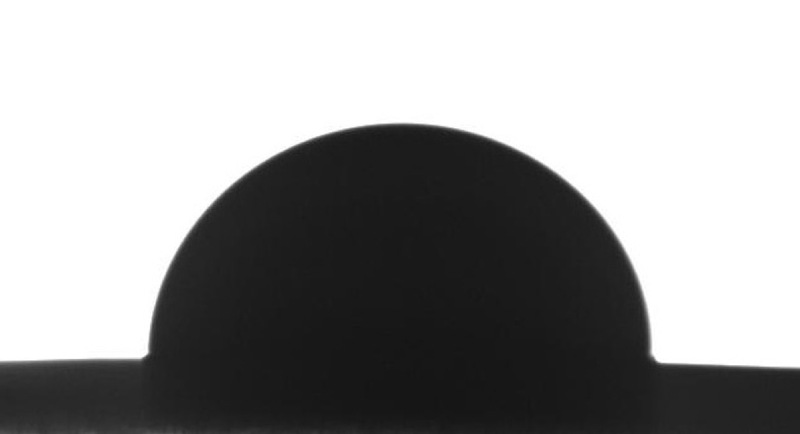 **Check that the stage surface is positioned at the correct height relative to the Telecentric Lens face (Too High –> blurry/too high baseline, Too Low –> non-uniform/too low baseline).